Not sure what to get your favourite fitness buff, athlete or client this holiday season? 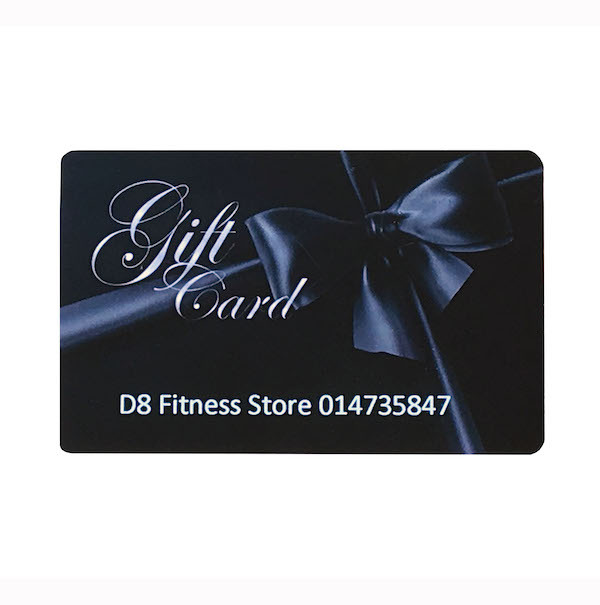 Give them the ultimate gift of choice with a Gift Card from D8 Fitness. Choose from denominations of €25, €50, €75 or €100. Our gift vouchers let them choose from our large selection. Shop online or in store. As a result, they get the gift they want or need. Choose from fitness equipment, training gear, workout clothing, footwear, nutritional supplements, educational materials and more. Want to add an amount other than those listed above? Easy! Simply call or visit our Store and we can arrange for a Gift Card to be sent with the denomination of your choice. Each voucher resembles a credit card. They arrive in a luxury paper envelope for a polished presentation. Buy them as stocking stuffers or corporate gifts. Buy them for friends, family, or clients and let them pick out the perfect item for themselves. D8 Fitness gift cards are now rechargeable. Simply call or visit our store and add money to the card. All vouchers are good for 5 years from the date of purchase. The fine print: Gift Cards ineligible for resell, transfer for value or cash redemption. They can only be used to purchase items from D8 Fitness, either over the phone or in our Dublin store location. Once purchased, gift cards cannot be returned or exchanged.